Sadly, I can’t recall any specific time when thirteen actually paid off for me, but I’ve always felt that it was my number. I have long rejected the traditional opinion that seven was a lucky number while thirteen was an unlucky one. Of course, my opinion on this matter was helped by the fact that I was born on the thirteenth day of the month. For years, my dad told me I was born on a Friday the 13th, and so I’d held a very positive opinion of that day, contrary to the typical superstitions. When I learned to properly compute calendar events I learned that I was, in fact, born on a Thursday, which left me feeling a little disappointed. To this day, though, I feel like any Friday the 13th is my day, regardless of whether the month matches that of my birth. And when my birthday does fall on a Friday the 13th, I feel like it’s an extra special treat. 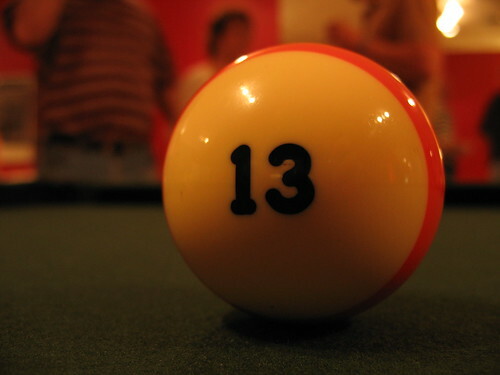 I’ve never been particularly superstitious, and I wonder now whether my affinity for thirteen was a cause or a product of that.